White House: Creation Of 'Cuban Twitter' Was Not Covert Program : The Two-Way According to a report by the Associated Press, the U.S. funded the creation of a social media platform designed to undermine the communist government in Cuba. 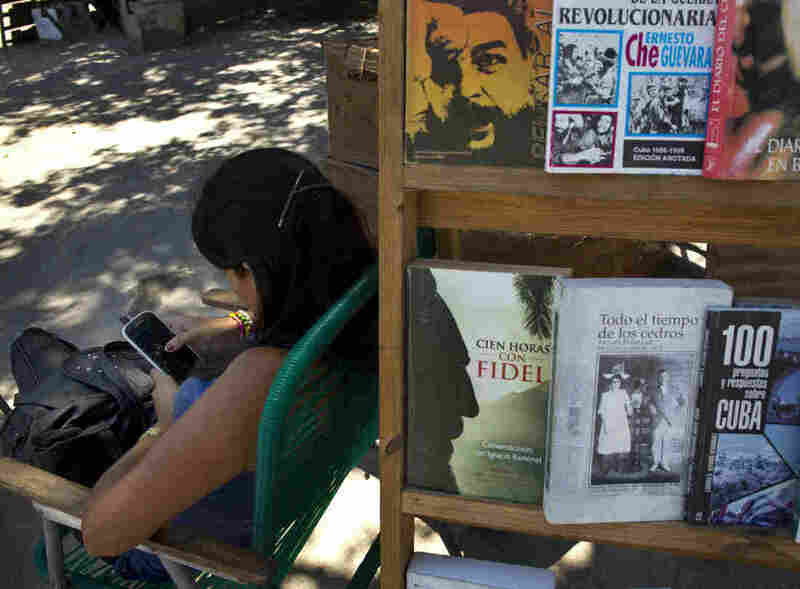 A book street vendor passes the time on her smart phone as she waits for customers in Havana, Cuba, on Tuesday. The Obama administration secretly financed a social network in Cuba to stir political unrest. The funding of a social media platform designed to undermine the Cuban government was not a covert American operation, White House Press Secretary Jay Carney said during his regular press briefing on Thursday. "The program referred to by the Associated Press was a development program run by the United States agency for International Development and that program was completed in 2012," Carney said. "As you know, USAID is a development agency not an intelligence agency." "The project, which lasted more than two years and drew tens of thousands of subscribers, sought to evade Cuba's stranglehold on the Internet with a primitive social media platform. First, the network would build a Cuban audience, mostly young people; then, the plan was to push them toward dissent. "Yet its users were neither aware it was created by a U.S. agency with ties to the State Department, nor that American contractors were gathering personal data about them, in the hope that the information might be used someday for political purposes." Carney went on to say that the U.S. does take steps to be discreet when operating in "non-permissive environments." A covert operation would be illegal. The AP story doesn't call this a covert program, but it strongly implies that it walks a very thin line. "USAID and its contractors went to extensive lengths to conceal Washington's ties to the project, according to interviews and documents obtained by the AP. They set up front companies in Spain and the Cayman Islands to hide the money trail, and recruited CEOs without telling them they would be working on a U.S. taxpayer-funded project. "The project, dubbed 'ZunZuneo,' slang for a Cuban hummingbird's tweet, was publicly launched shortly after the 2009 arrest in Cuba of American contractor Alan Gross. He was imprisoned after traveling repeatedly to the country on a separate, clandestine USAID mission to expand Internet access using sensitive technology that only governments use."